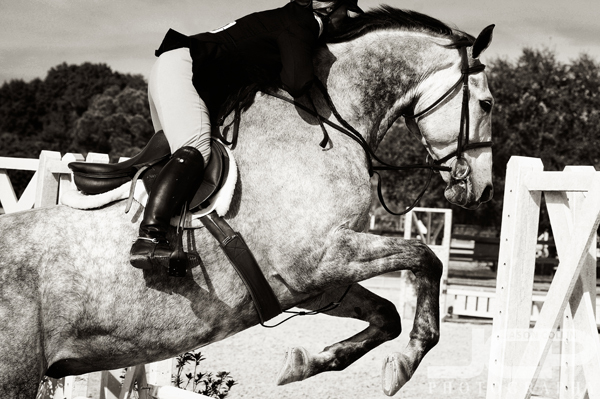 Jumping is a powerful action by the horse, though at full speed it looks like it takes little muscle. 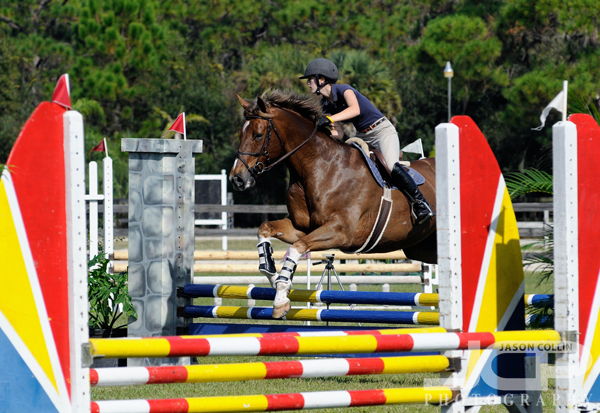 To a person not versed on the intricacies of horse jumping, it is nearly impossible to tell a good ride from a bad ride unless the horse knocks down or hits the top bar on a gate. I have photographed several all day equestrian events as a freelance photographer for Tampa Pet Photography, and I am only just learning what the judges actually look for. The whole time I am still thinking, "why does the horse even need direction to know how to jump over the gate? Can't it just do it on its own?" 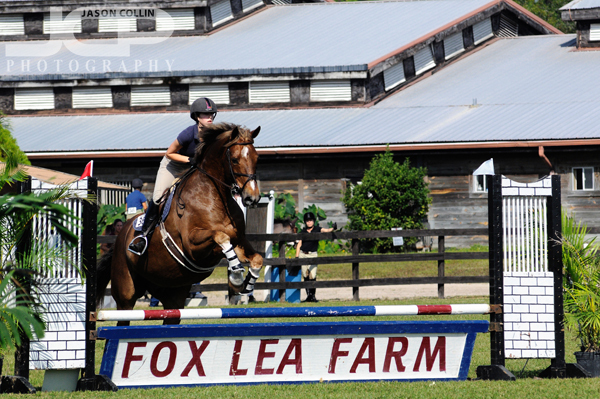 Fox Lea Farm in Venice, Florida is a large, three corral equestrian venue. 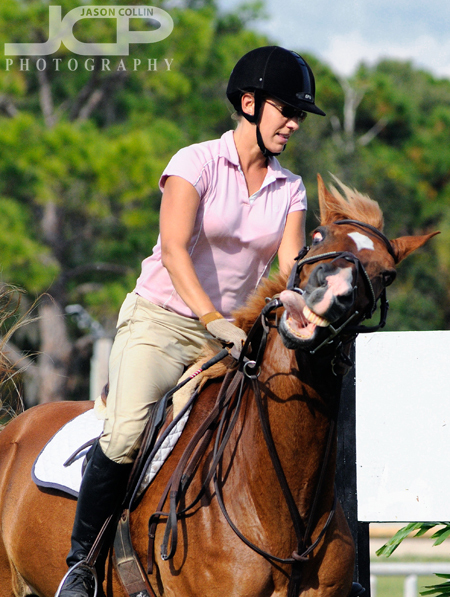 Then there are the intricacies of getting the ideal equestrian shot. The number one priority is making sure the horse's legs are curled under its body. Capturing the horse at the apex of its jump while still only just above the gate is the next photographic target. Having the rider pressed tightly against the horse's neck with her (99% of the time they are female riders) face showing would then make it a technically perfect equestrian shot. Obviously this takes a lot of practice and knowledge of the course (i.e. 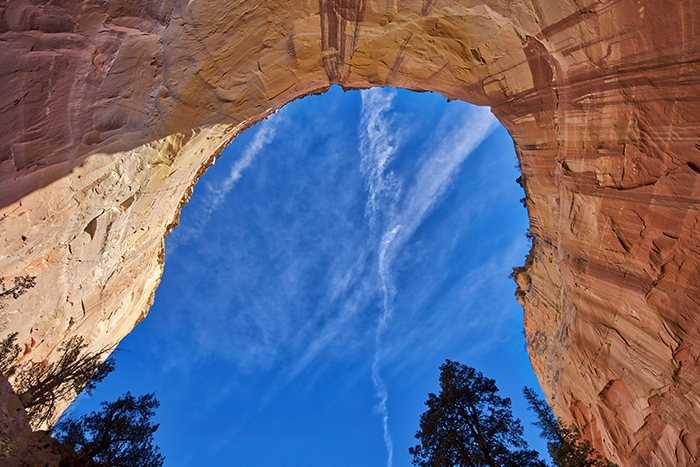 which direction they jump the gates) and the ability of getting a clean field of view while still ideally having the sun to your back. Such conditions do not often arise in the glaring late mornings and afternoons in Florida. I try and memorize the order in which the rider and horse jump over the gates then focus on the 3 or four gates I can actually make a good shot from. It really helps to have a camera capable of a very high FPS shooting speed. My Nikon D300 can at its peak get 6 FPS, and that is the bare minimum. I would certainly like to have the D3s' 9+ FPS capability. No matter what FPS your camera is capable of, memorizing the course the riders and horses follow over the gates is essential to having any chance at making an ideal or otherwise equestrian photograph. Out of maybe 14 gates on the largest course and about 8 on the medium sized one, I am usually lucky to be able to have 2-4 gates where it is even possible to make a technically perfect equestrian shot. All the other gates are either at the wrong angle to my vantage point, too far away, obscured, or so directly backlit that the shot would have no quality to it whatsoever. I don't know if I'd trust my physical well-being to a horse in this mental state. I can report the woman cleared the course on that horse without incident fortunately. People are not the only beings to make extremely funny faces while engaged in sports. The horses can be caught in quite embarrassing poses as well. It is a rule not to snap away when the horse gets too close, especially if you have a really loud camera actuation (my D300 does) so as to not spook or distract the horse. Of course flash is totally forbidden. The Michael Jordan of horses! This weekend I will continue my pursuit of making the ideal equestrian shot!